RPM Rural Products offer a range of yard panels and gates that are high in quality and offer value for money for every category of producer. The flagship 50NB yard panel is a heavy duty unit capable of handling extreme operations and is notched for extra strength. The rails are never squashed. 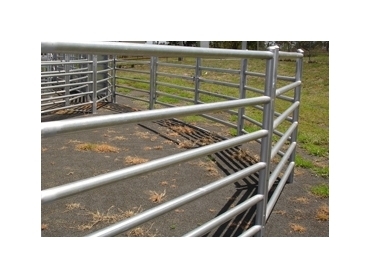 Perfect for the middle range of livestock producers, the oval rail yard panels are strong, durable and high in visual quality. These yard panels have all the features needed to perform in both small and large yard systems. Also available from RPM Rural Products are EconoPanels. There are an excellent solution for managing horses, cattle and other livestock.